Humans have used the kiawe family of trees since at least 6500 BC for food, fuel and basic raw materials. Wood has been found in tombs in many archaeological sites in Peru dating as far back as 2500 BC. In Arizona, bedrock mortars have been found and it is now believed that these are special implements designed to grind the pods into flour. The native home of kiawe is from California to Texas and through parts of Mexico, Central and South America, as far south as Buenos Aires. The tree was planted in December, 1828, in the north corner of the Fort Street Catholic church yard in Honolulu near Beretania Street. “By 1837 there were already several algarroba trees from the seed of the first one”. Sandalwood, Curley Koa, Naio, Willi Willi, Hala Pepe and others at one time, covered much of the leeward coast. The unsustainable harvesting of Sandalwood lead to nearly complete deforestation and major changes to the hydrology. The leeward coasts of all islands in the state of Hawaiʻi tend to be arid to semi-arid, subtropical/tropical climates; there, the kiawe thrives. More than 150,000-acres of dry kiawe forests in Hawaiʻi are descended from the single tree planted in 1828 in downtown Honolulu. In August 1832, the tree was found to be hearing fruit. By 1840, progeny of the tree had become the principal shade trees of Honolulu and were already spreading to dry, leeward plains on all of the islands. Wood for fuel, charcoal, timbers, and posts. Pods for fodder in their natural state and crushed into meal. Trees for reclamation of waste land, ornament, and shade. The historic value of the kiawe in Hawaiʻi has been enhanced by the ease with which it can be propagated and its ability to grow in arid regions. The tree belongs to the leguminous family, and begins to bear pods when six years old and even younger. These are eaten by stock, but the small seeds are not crushed while passing through the alimentary system but rather are prepared for quick germination by the action of the digestive fluids. The spread of the tree in these islands has, therefore, been due solely to stock and by this means the kiawe has become a wild forest tree. It is estimated that it would have cost at least one-million-dollars to plant by human agency the 80,000-odd acres in these islands which have been covered with more or less density by kiawe forests. And this wonderful and comparatively rapid spread of the tree has been accomplished without the expenditure of one cent for planting. The kiawe, moreover, has been spread mainly on the barren lowlands, although it has gradually been working up the valleys and slopes until it is now found well established at elevations 1,800-feet above the sea. Irrespective of how folks felt about it 100-years ago, kiawe is considered an invasive pest and a noxious weed, because of the aggressive and expansive nature. It produces a large number of easily-dispersed seeds and also establishes itself by suckering, producing thick stands that shade out nearby plants. It requires less than 4-inches of annual rainfall to propagate and grow. It is efficient in drawing water from the soil that it deprives other plants of water. 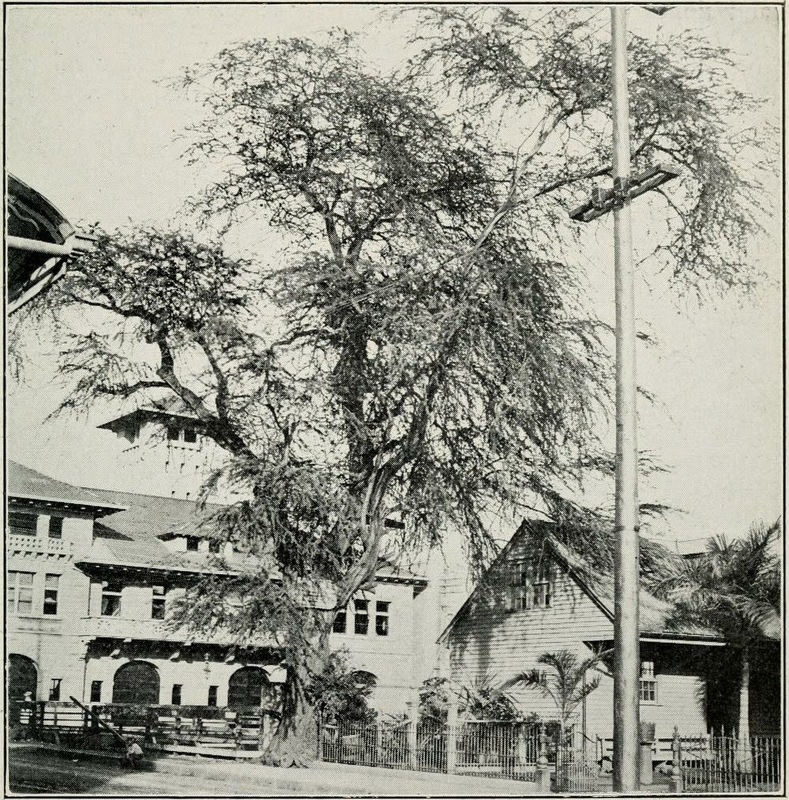 The image shows the first kiawe tree in Hawaiʻi – on Fort Street near the Our Land of Peace Catholic Cathedral (TheHawaiianForesterAndAgriculturist-1916.) In addition, I have included other related images in a folder of like name in the Photos section on my Facebook and Google+ pages.